You will need to have a personal Discovery Service account in order to save searches. You can retreive saved searches and re-run them whenever you log back in. 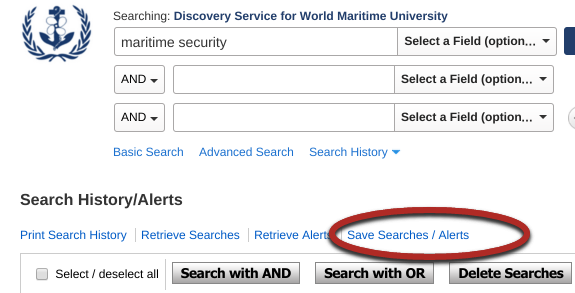 You can also save searches as "Alerts" that will email when there is new content added to the Discovery Service that meets your search criteria, or can be saved as an RSS for display in RSS readers or embedded in web pages. Click the Search History link, then click the Save Searches/Alerts link. The Saved Search/Alerts Screen appears. If you have not signed in to My EBSCOhost, you will be prompted to do so. To save the search, click Save; otherwise, click Cancel. You are returned to the Search History/Alerts Screen. You can retrieve your saved searches and alerts and edit and reuse them. 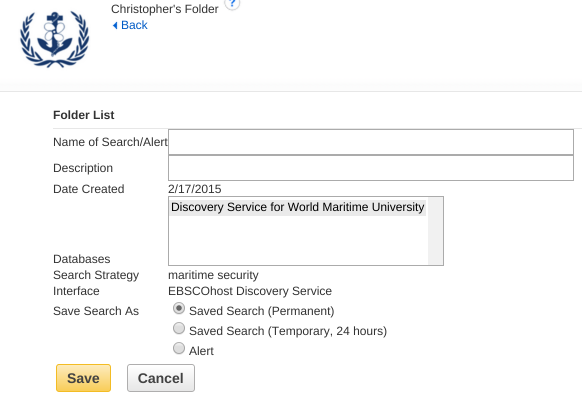 From the Search History/Alerts Screen, click Retrieve Searches. If you have not already signed into your personal account, you will be prompted to do so. Enter your user name and password; or click Cancel and return to the Search Screen. The Saved Searches area of your folder displays. Click on the Retrieve Saved Search link for the desired search.